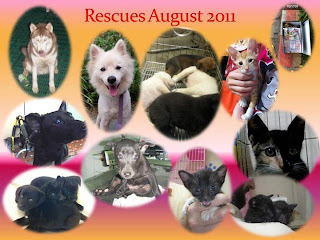 August has been a very fulfilling month with many adoptions and lots going on. We are still preparing for our first ever Gala Ball and have been overwhelmed with the support from our sponsors. 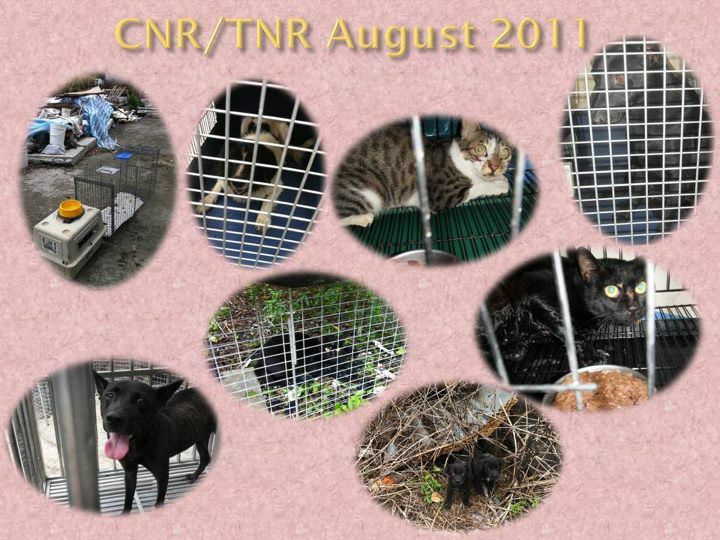 Also our TNR projects have been in full swing. We are now working with many volunteers and vets around the Taipei area and what’s more the government is now starting to listen and see how successful we are. We’ve continued helping the Ping Shi shelter and have had great success with adoptions from there. We’ve also started an online flea market on our facebook page where everyone can see our items for sale and get great bargains while helping the needy animals. 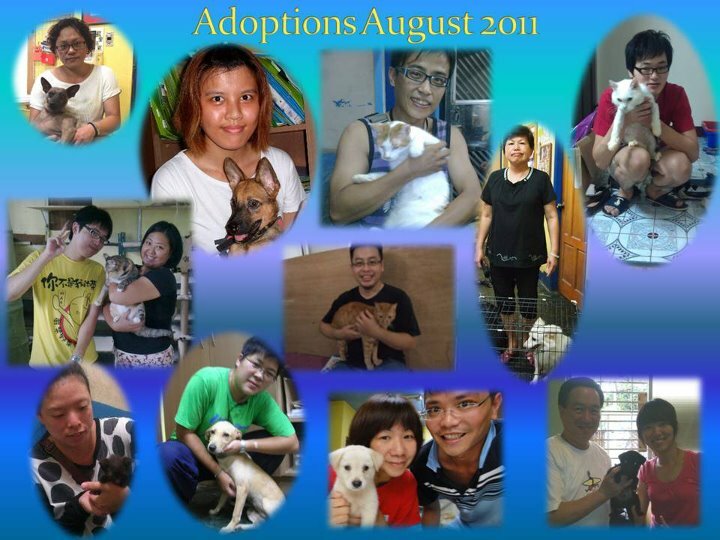 We’ve had a total of 13 successful adoptions this month and hope to continue this great momentum. We’ve had many puppies come into the centre recently from CNR projects and from various other rescues. Rome and Naples are from the CNR project last month in Hsin Tien and have now found loving homes. Surf is one of the four puppies dumped on our doorstep one hot morning. He has now been adopted into a loving home. Soybean the last puppy from the Mucha drain pipe rescue has finally found a loving mum and it means that everyone at AT still gets to see her. Our staff member ShiTing has adopted Soybean and they are inseparable. East, one of the four puppies from another CNR project in Hsin Tien has also found a loving home. We hope his brothers and sisters are going to be as lucky. We are so happy to report that Foxy and A-Mei two of our longer term doggies have been adopted. We were worried about Foxy because although she is beautiful and a small breed dog, she is very shy and nervous around people. However, finally a loving family who are willing to look past this have taken her home. She’s doing much better and now comes to sit by her new mommy. Ninja, who was brought out of the Ping Shi shelter found a new home within 7 days. He’s a very loving boy and we knew he’d find a home quickly. Everyone was sad and happy to see A-Mei go to her new home. A-Mei has been the star of many of our events and everyone who comes to our centre gets a kiss and a cuddle from her. She has finally found her forever home and is doing great. Two of the cats that we brought down from the Ping Shi shelter were adopted quite quickly. Danish the ginger and white boy and Bibi the smaller white Persian. Both have gone to loving homes and can finally get the attention and love they deserve. 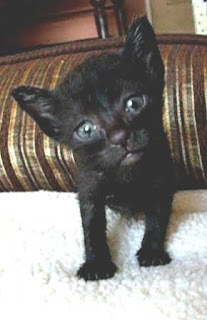 Little Nami is the first of the 4 little black kittens to be adopted into a loving home and w hope her brothers and sisters will also find loving homes soon. We’re also really happy that two of our adult cats, Ningbau and Peanut found loving homes. We are always happy to report adoptions and it gives us the drive to push harder and try to find homes for all our loving furry friends. Many people over look the adult cats and dogs as they don’t think they will be as easy to train or adapt to a new home. This isn’t true, given the chance all our furry friends will adapt quickly and be more than willing to get some training. All they need is love. On the fostering front we are happy to report that Julian, one of our wheelchair dogs, has been taken into foster care by one of our board of directors. Julian was having problems with his legs and needed more one on one care. He has already started to put on weight and is zooming around his new home showing his new foster brothers and sisters how fast he can go. A feeding lady near our centre was feeding the dogs one morning when Awang, one of the dogs she feeds run out of the bushes and straight into the road. He as badly hit by a car and was in terrible pain. The feeding lady didn’t know how to handle the situation as this dog has a reputation of not being so friendly, so she called us. We went out and managed to catch Awang without too much trouble. After a vet check up it was found that he had a broken spine and wouldn’t be able to use his back legs. He has had treatment and now has a new BMW wheelchair. It took him some time to get used to the chair but finally he’s now on the mend. He spent most of August with us and now the feeding lady has taken him back and will continue to look after him. A supporter of Animals Taiwan found 4 little kittens in a box dumped on the side of the road. Vivi, Nami, Zoro and Luffy were very small and needed help with feeding. The rescuers took them in and helped them until they were able to eat by themselves. 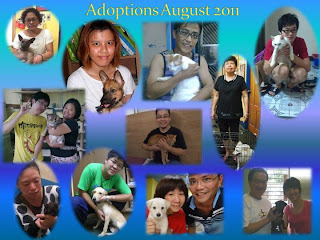 Then they were brought to our centre for adoption. Nami has already gone to a loving home. One morning our neighbours came running over to our centre to let us know that 4young puppies had been dumped on our doorstep. It was a hot August morning and the puppies had no shade, food or water. We did catch the lady on camera dumping the puppies on our doorstep and we have reported her to the authorities. It was irresponsible of her to do this and endangered the puppies’ lives. Luckily, they were ok and we found them quickly. Flash, Charlotte, Little Cotton are doing well. Surf has already been adopted. We got a call from a volunteer about 3 puppies in the mountains where she goes for her morning walk. She informed us that one of the puppies couldn’t walk properly and was dragging her back legs. We set off out to find her and it took quite awhile driving round the mountains. Eventually, we found the spot and got out of the car and called. Violet made a whining sound and we rushed to the bush to find her. She let us pick her up and quickly gave us a kiss. After the vet examined her it was found that she has a malformed spine, either from birth or she was hit by a car or something very early on in life. As the spine isn’t broken she still has feeling in her back legs and can move them, she’s just unable to stand up. The vet feels that with the help of a sling and a wheelchair she’ll start to build muscles in her legs and her spine should start to straighten out. She’s already looking much better and wants nothing more than cuddles. This month we took two dogs and a kitten from the Ping Shi shelter. Ninja, small white dog, who is very friendly and playful, got adopted within 7 days of being at our centre. He’s now very happy in his new home getting the love and attention he craves. 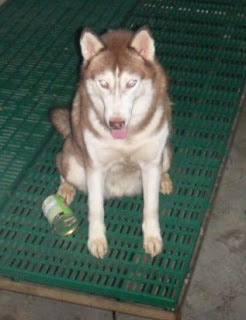 Hucky, brown Husky, will be flying to Seattle in September. We decided to take her out of the shelter and send her to America as Taiwan is not the right climate for a Husky and she was learning bad habits being in the shelter. 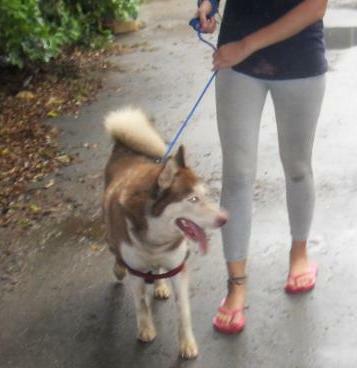 Huskies need a lot of exercise and also mental stimulation which she wasn’t getting at the shelter. She’s off to an animal behaviourist in Seattle where she’ll receive training before finding a loving new home. We also took a little kitten, Joker, as there isn’t much chance of this kitten being adopted while being in the mountains at the Ping Shi shelter. 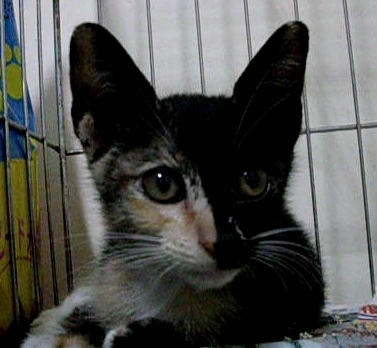 Shorty was brought to our centre after being caught during a TNR project. She’s friendly and has a chance to find a good home. Unfortunately she has FIV; however, this won’t stop us persevering to find a loving home for her. While in the Tiamue mountains on a CNR project we came across a mother and 8 puppies. We realized that these little boys and girls wouldn’t survive long in the mountains so we decided to take them in to find them new homes. One of our wonderful volunteers and supporters has taken them in and has already found homes for 4of them. We have our fingers crossed that the rest of them will find loving homes soon. 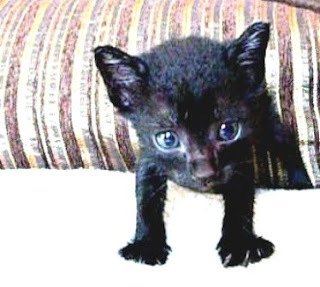 A little kitten now named Cha-cha was found under a car. He had many wounds on his body and was found to have bad diarrhoea and malnourished. After receiving treatment Chacha recovered fully and has already found a forever home. Finally some bad news, a little kitten was rescued after a bad car accident. He was taken to a vet immediately, but his injuries were too severe and he was in a lot of pain with not much chance of recovery. The vet suggested that we let this little boy pass on as the pain was too great for him. We hope he is now happy and without pain. As we’ve already mentioned our TNR project in Taipei is fully underway, in July 156cats were captured, neutered and returned to their feeding areas. August is looking as though it will surpass these numbers. So far since April 388 cats have been caught. We will be continuing this project and keeping the government updated on the progress and data received. We also caught 2 female and 1 male dogs from the Tiamue mountain where there are many stray dogs. Also we have the WAD event in Taipei on 1st and 2nd of October. Please check our facebook for more news on this. Flash the puppy healthy and playful, needs a home. This black puppy is playful and friendly , sweet. He was born around 2011 July. Hucky is going to Seattle today!! Hucky will take the flight today!! let's cross our fingers for her. We're still raising money for Hucky as she'll be leaving on 13th September for the US. We not only need to pay for her flight which will be quite expensive as she's over 30kg but we will also have to buy a new crate as she's so big. We've just got a quote for the crate $7500so if you'd like to help Hucky get to the US please see details of how to donate. UP Date (Aug)! Hucky flies to Seattle tomorrow at 23:00. We wish her a safe flight! We'll update everyone with photos from the airport and with photos when she's in Seattle, We'll also post an expenses sheet and donations recieved. Thank you everyone for making this possible. A playful kitten, Joker, is looking for a loving home. A playful kitten , Joker, is looking for a loving home. Luffy, the kitten , needs a home. Luffy is kiiten ( was born around 2011 July) who was rescued by AnimalsTaiwan, he/she is now at our rescue center looking for home.